Package includes: 1 paper fan+ 1 paper lantern+1 paper pompom+1 honeycomb ball+1 paper drop+1 paper heart honeycomb ball,total 6pcs. Beautiful blue paper decoration series. 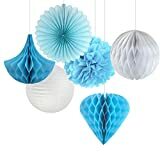 These colorful lanterns,honeycomb balls, paper fans,pom poms flower are quick and easy way to add sophistication to a formal gathering or to brighten up a dinner party. They can also be painted and decorated making them activity for kids and adults alike. Material: High Quality Tissue Paper. Ship Flat, Individually packed. Occasion:Home Decoration,Rehearsal Dinner,Birthday party, Bridal Shower, Baby Shower, Wedding,Bridal Shower or for a Nursery these are the perfect decoration for that special occasion. We usually ship out by ePacket, it will takes about 8-15 days to be arrived. If you want to own it quicker,you can choose expedited shipping service at checkout. Any problem about our products please feel free to contact us,we will response you within 24h and try our best to help you. We are professinal crafts manufacturer with 10 years experience, offering over thousands of festival supplies and party decotarion products. We stick to “Customer first,Quality first,Credit first and Service first” to do the business with our customers.Our products are mainly exported to Europe ,East Asia, South-East Asia, and America.